The Financial Express reports that WelcomHeritage, the largest chain of heritage properties in India, has signed two new heritage properties in Rajasthan and Goa (Hotel Panjim Inn). In Rajasthan, it has signed a 40-room hotel in Mukundgarh Fort, one of the many beautiful havelis of the Shekhawati region. 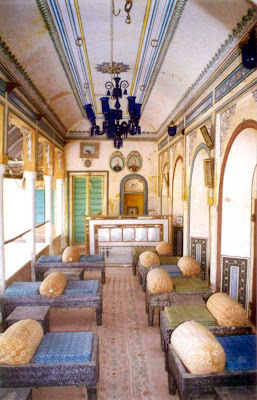 The interiors of Mukundgarh Fort, with traditional Rajasthani seating and a modern bar! See more photos at Travel Webshots. WelcomeHeritage plans to promote it as a spa destination. WelcomeHeritage has 63 heritage properties with the maximum in Rajasthan (19 properties) followed by Uttarakhand (8 properties), Himachal Pradesh (6 properties), and Madhya Pradesh (5 properties).